Can Food Dyes Cause Stomach Aches? Artificial food dyes are commonly added to manufactured foods in the Unites States and abroad. 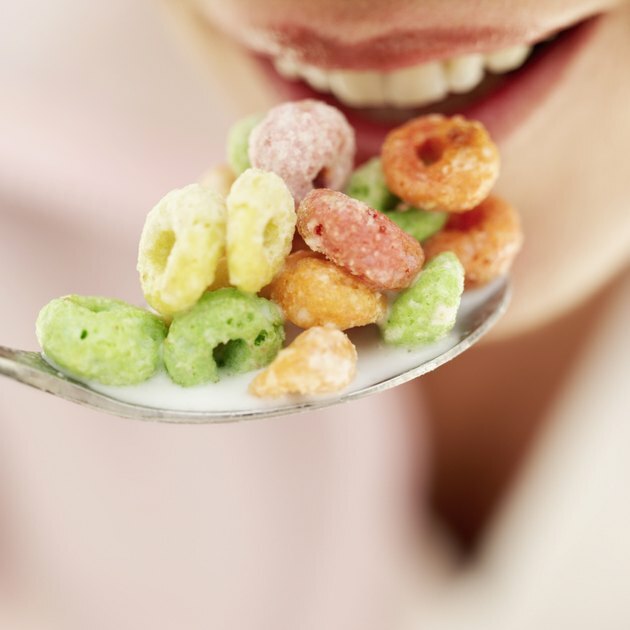 According to the Center for Science in the Public Interest, or CSPI, food coloring is in a wide variety of edible items, from candy to cereal and salad dressing. While your instincts may tell you that a brightly colored food is better, food coloring does not offer any nutritional value, and it might even trigger food allergies. In studies of nine different food dyes, no fewer than four have been found to cause allergic reactions. The Cleveland Clinic reports that a food allergy is an immune system response caused when the body mistakenly defends itself from a food ingredient as if it were harmful. Symptoms of food allergies include cramping stomach pain, diarrhea, shortness of breath, chest pain and swelling of the airways. According to the CSPI, food dyes linked to allergic reactions include brilliant blue, or Blue 1; allura red, or Red 40; tartrazine, or Yellow 5; and sunset yellow, or Yellow 6. These dyes have also been linked to tumors of the immune system, kidneys, adrenal glands and testicles in animal studies. A half dozen studies have shown Yellow 5 to be a genotoxic substance, making it capable of causing a genetic mutation that can lead to the development of tumors. Up to 25 percent of people believe that they're allergic to certain foods. However, most people who react negatively to food actually have a food intolerance, which, unlike an allergy, does not involve the immune system. The symptoms – nausea, stomach pain, gas, cramps, bloating, heartburn and diarrhea – can still be very unpleasant. Ninety percent of food allergies are caused by eight different natural foods, none of which are dyes. Certain food additives, including tartrazine and Yellow 5, are known irritants for some people. It's hard to avoid foods containing dyes linked to stomachache-causing allergies and intolerance. The Institute of Agriculture and Trade Policy, IATP, has compiled a database of dyes and the foods in which they're used. For example, one popular angel food cake mix contains all the dyes that can cause abdominal pain. Oatmeal, chocolate milk, sports drinks, colas and fruit-flavored beverage mixes, including sugar-free varieties, contain combinations of these colorings.